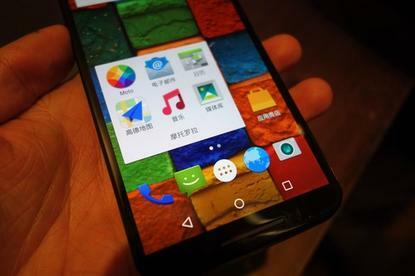 Motorola wants to offer a pure Android experience with its phones in China. Lenovo wants the Motorola team to shorten its product development time, CEO Yang Yuanqing said in an earnings conference call Thursday. "By the end of the life cycle the product is not competitive, particularly the Moto G, the Moto X," he said. Yang wants the company to update its smartphones and add new models every six months. "In the future we will improve our product development cycle. So in every moment our product will be competitive," he said. Following a streamlining of the business, Lenovo will also create a simpler handset portfolio, with fewer models. On Thursday, the Chinese company announced it would cut 3,200 jobs and restructure its mobile business, with the aim of creating a leaner operation that can better compete. Motorola Mobility, which Lenovo acquired last year, will be among the business groups facing employee layoffs, company executives said. Lenovo paid US$2.9 billion for Motorola, but the business has been costly to run, and is still posting losses. The company has vowed to turn around the Motorola operation in the next two to three quarters. During the earnings call, Yang said the Motorola business takes $2 billion to run. However, Lenovo's own existing smartphone business costs only $400 million in expenses, yet ships about the same quantity of products. "So that is way too high," Yang said of Motorola's business costs. "We think we can save $850 million after the restructuring." Lenovo is making the changes as its faces tougher competition in the handset market. During the second quarter, its smartphone shipments grew 2.3 percent year over year, but its overall market share fell. Lenovo's rivals in China, including Xiaomi and Huawei, posted 29 and 48 percent growth, respectively, according to research firm IDC. But even with the cost cutting, Lenovo is confident the restructuring will lead to robust smartphone growth over time. Yang said he wants his company to become the third largest smartphone vendor behind Samsung and Apple.